Winiarski’s book, which was announced as a finalist for the 2018 George Washington Prize earlier this month, is one of three works that will be awarded the annual $10,000 Bancroft Prize by Columbia University next month. Nearly 250 finalists were considered for the prize. The Bancroft Prize is one of the most prestigious honors in the field of American history. The books are judged in their scope, significance, depth of research and richness of interpretation. 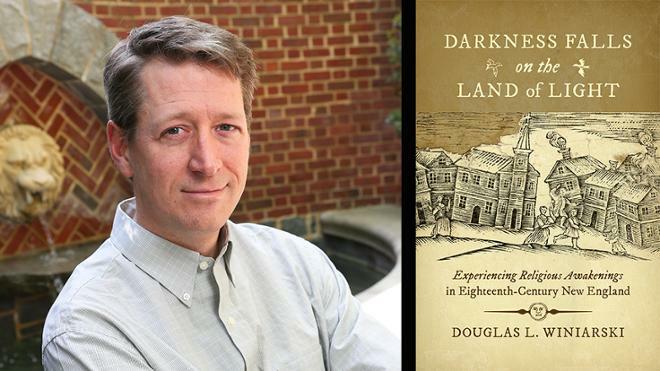 By chronicling the religious beliefs, practices, and experiences of 18th century New Englanders through diaries, letters, devotional journals and other rare manuscript sources, “Darkness Falls on the Land of Light” highlights how evangelicalism emboldened ordinary people to question traditional authorities. Winiarski will be the second UR Bancroft award-winner, joining former professor of history Woody Holton, who won the award in 2010. Tucker-Boatwright Professor of the Humanities Edward Ayers, also won a Bancroft Prize in 2004 while at the University of Virginia.